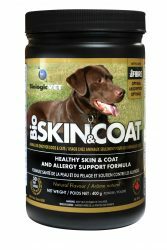 GMO-Free BioSKIN&COAT was designed specifically for the canine and feline metabolism and gastrointestinal tract, with biologically active ingredients that have not been exposed to oxidation. BioSKIN&COAT works synergistically with our Nutritional Foundation Products BioVITES and BioFATS, a canine-complete precise ratio of essential Omega-6 and Omega-3 fatty acids with DHA and EPA. Helps optimize, nourish, protect and support general health including skin and coat health. CAUTIONS: Do not exceed the recommended dose. Give orally on a full stomach. Not for long term use, unless directed by a veterinarian. * Do not use in 1) pregnant or lactating animals 2) animals with bleeding disorders, gastrointestinal ulceration, kidney or liver disease. Do not use in animals with diabetes, unless directed by a veterinarian. This purposely vague description is neither clearly defined nor is it a fixed duration of time. It may include a time frame of several days, weeks, months or even years. Health Canada requires the use of this statement on our labels as part of the Interim Notification Program (The Program) for Low-Risk Veterinary Health Products (LRVHP). This statement is summoned when certain ingredients are present in a product, such as enzymes or various herbal extracts. In BioSKIN&COAT it is the Quercetin that requires the statement. The delivery system of BioSKIN&COAT is a certified organic blend of defatted flax, sunflower and sesame seed providing the good bacteria in the intestinal tract of the dog or cat a valuble prebiotic food source to improve their immune system. This fibre also supplies plant estrogens called lignans that the good bacteria convert into mammalian estrogens balancing hormone function in the dog and cat especially when they have been spayed or neutered. Each scoop (1 tbsp) will provide at minimum 20 mg of lignans, enough for the Vet recommended amount of 1 mg of lignan per lb of pet weight. By improving the intestinal tract function, immune system, and hormonal function of the dog or cat there is better absorption of the nutrients from the formula as well as from the food they are eating allowing the BioSKIN&COAT formula to begin to work in a very short time.